Lighting plays a key role in interior design, an indispensable ingredient for providing personality, amplifying spaces, or accentuating the role of certain elements over others. Both in its natural and artificial versions, lighting enriches any space, and more so if it has been designed to highlight moods, textures and nuances. Its capacity to multiply experiences is made even more possible thanks to cutting-edge technology such as LED. The LED lighting trend has expanded the possibilities for interior design and decoration; whether it’s giving privacy and tranquility to spaces, illuminating dark corners where natural light does not reach, or drawing attention to furniture, atmospheres and decorative details. With the clear purpose of creating attraction, accentuated lighting alters the light to generate contrasts and create visual interest in certain areas or on objects, chasing the hierarchy of a space and guiding one’s gaze to an interior journey. Our Pro-Light technology allows you to integrate concept lighting into design in a natural way, utilising a simple application frame for a highly aesthetic experience. The Pro-light collection is a concealed lighting profile, specially designed for ceramic wall tiles, but it can be used for flooring as well. LED strips U-linked to the profile are used, and combined with a diffuser cover. Depending on the profile position, the light effect can be direct or indirect. These elements create amazing optical effects. Volumes, attention to detail or floating designs are just some of the possibilities offered by Pro-Light. 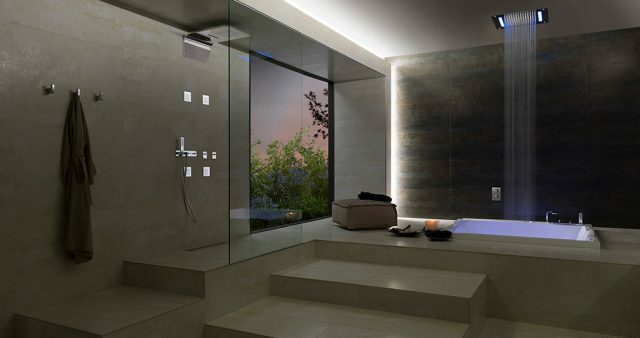 Created for use in spaces where water is present – this simple lighting solution will embellish your floors and walls and turn your bathroom design into something truly spectacular. Our new showroom features Pro-Light used to highlight niches and deliver striking gap lighting atmospheres in five of our bathroom room sets. Visit us and be inspired to introduce accent LED lighting into your space.